So this is kinda like the baked egg and hot tomato but quicker, tastier and possibly healthier – because there are olives in the tapenade and they’re reputed to be very good for you. The tapenade is something I make as a dip quite often. So there’s often a tub of it in the fridge. I can – and usually do – make an even lazier version using a blend of shop bought roasted peppers, black olives, sundried tomatoes, peppadew peppers and some olive oil and a couple of tablespoons of the oil from the jar of sundried tomatoes. The tapenade in that recipe is nicer – you can’t match the sweetness of the peppers you roast yourself – but it’s great to have something you can make with stuff from jars that have long shelf lives. Very convenient. So one morning a couple of weeks ago I put these ingredients together and it was so good and so easy I decided yep, I’m posting this. By the way I think this tastes best if you let it bake till the egg is completely cooked through – not runny. If you’re using tapenade that’s been in the fridge and you’d also prefer the egg to be not runny then it will take 30 minutes to bake. Add a couple of tablespoons of tapenade into a large greased ramekin (or custard pot). 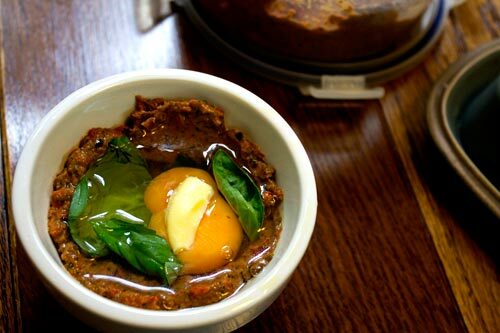 Make a hollow in the tapenade, add a few leaves of basil and top with the egg. Add another couple of basil leaves and a little pat of butter. Bake in the oven for about 20 minutes - or until the egg has solidified and is no longer wobbling. This takes longer to cook than the other baked egg recipes. Let it cool for 5 minutes. Enjoy! Or in a food mixer add a drained jar of pitted black olives, some sundried tomatoes, roast red peppers, some Peppadew peppers and a couple of tablespoons of olive oil and a couple of tablespoons of oil from the jar of sundried tomatoes. Assembled a few seconds and ready to bake. Take it out of the oven and leave to cool for 5 minutes or so. A messy spicy bite of goodness.